Stephen and I are pretty big Radiohead fans. Laura Allen can testify that I listened to them A LOT in college. Definitely, we are listening less often these days. I've spent a couple afternoons in my bedroom working on making a space for our new baby. I set up a crib and hung some pictures. We had a chance to listen to the baby's first CD, Rockabye Baby! 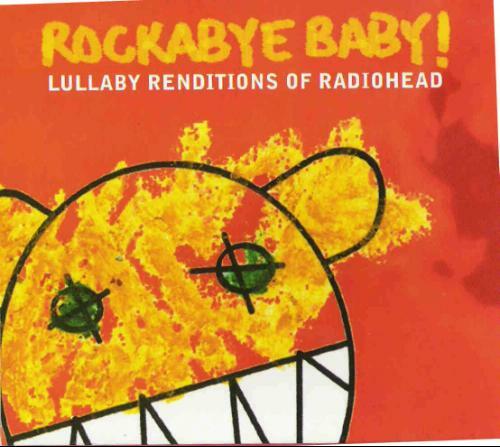 Lullaby Renditions of Radiohead, which was lovingly given to us by our friends Jon and Kelly. He liked most of the tunes, and told me he thought the baby would really like it. Forget the music, though. He wanted to know, "Mom, who is that on the cover." "Well, Schroeder, that is the Radiohead bear." A half hour later he said, "Mom, I wonder what the Radiohead bear's voice sounds like." That is a question I couldn't answer. Today, as we were hanging some more pictures above the crib and listening to the CD, he says, "Mom, does the Radiohead Bear have a mom and dad?" We've been reading this barely tolerable repetitive book by Eric Carle called Does A Kangaroo Have A Mother, too? Eric Carle includes EVERY animal you can think of and we discover that they all, in fact, have mothers. But that dude left out the Radiohead Bear. So I said to Schroeder, "Do alligators have mothers?" in the same rhythm of the book, and he instantly understood that despite his crazy appearance, Radiohead Bear was once loved by a Mother and Father.